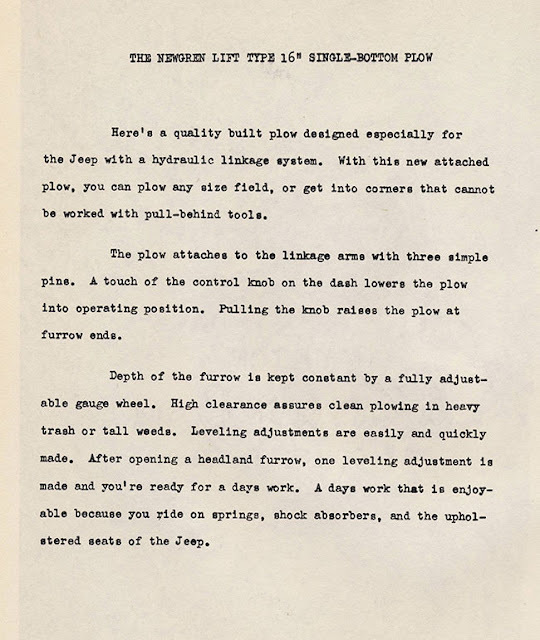 Dave, at eWillys.com posted an early Jeep testimonial letter that included information on the pull-type Newgren plow. Barry asked if there were other documents available and Dave responded with another article. It was like Christmas in July for Barry. The following is a discussion of a couple of the ads that were posted. 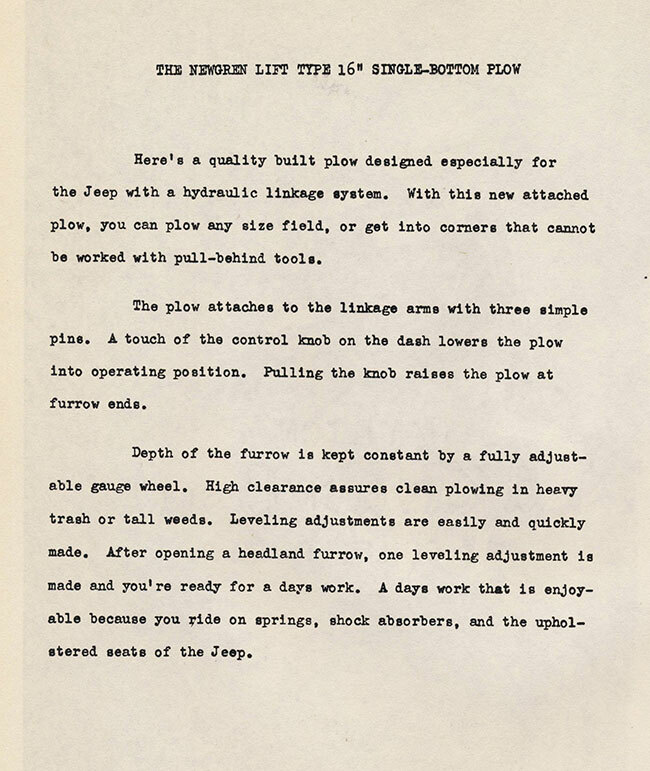 We posted a brief history of Jeep lifts and part of that story involved the Monroe Auto Equipment Company purchase of the Newgren Equipment Company. Monroe stopped production of the Newgren hydraulic lift and Newgren became the major producer of implements for the Monroe Hydraulic Lift. Newgren would later be sold to American Bantam. The documents in the eWillys article give us a snapshot of the quick transition of Newgren from producers of lifts and related equipment to a provider of equipment for Monroe. This page from the Willys-Overland Equipment shows both the old and new Newgren. 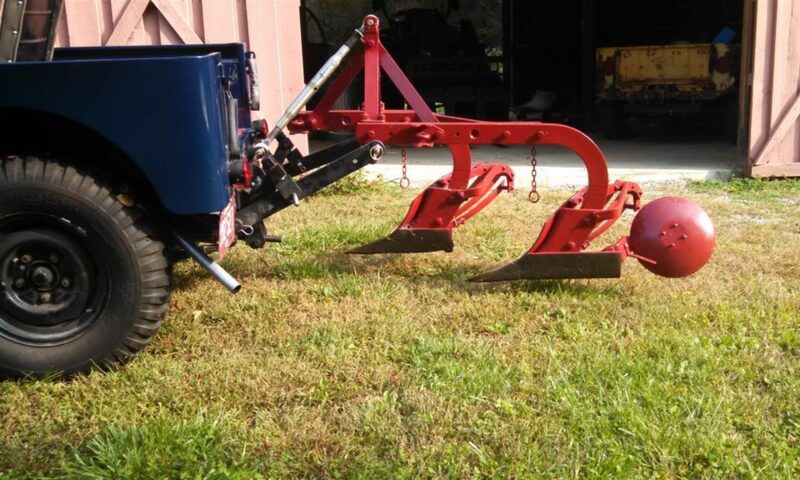 The plow is a model WP-L1 (made by the Wiard Plow Company for Newgren) with the distinctive “short” mast, The mast is the structure at the top of the plow that is the third “point” of the 3-point lift. 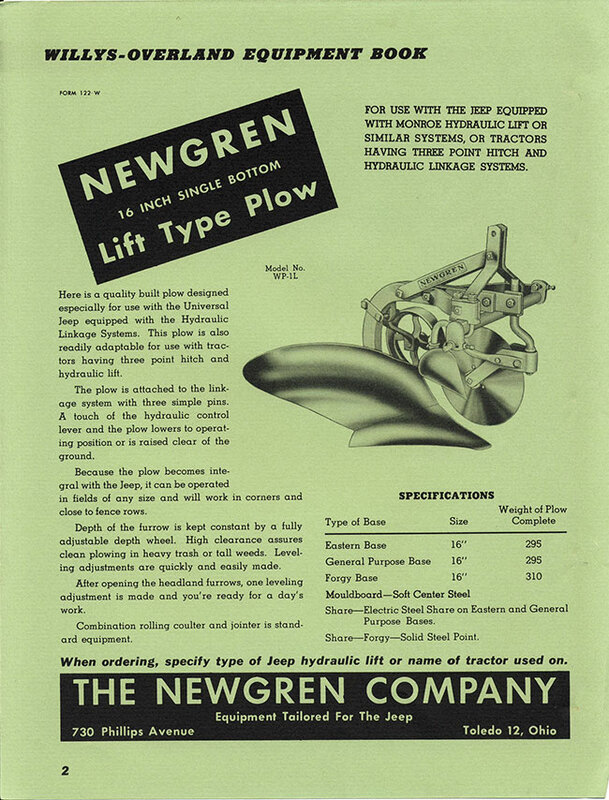 Both the Love and Newgren lifts required plows to have a short mast to maintain proper 3-point lift geometry. The design of these two lifts allowed for use of the tailgate and bed at the expense of some equipment performance. It is interesting to note that the Stratton lift produced in the early 1960s overcame this geometry problem, allowing, once again, for the use of the tailgate and bed space with the lift installed. The Monroe lift placed the lift in the bed and the top link (the point that attaches to the mast) location matched that of the Ford/Ferguson system. That system would become the standard for 3 point hitches in 1959 when patents expired. The opening statement “FOR USE WITH THE JEEP EQUIPPED WITH MONROE HYDRAULIC LIFT OR SIMILAR SYSTEMS, OR TRACTORS HAVING 3 POINT HITCH AND HYDRAULIC LINKAGE SYSTEMS” provides some important information. First the Monroe lift has replaced the Newgren lift at this time, although we know the “similar systems” refers to the Newgren (or Love) lift. The fact that it will work on “tractors having 3 point hitch(s)” – that would only be Ford and Ferguson tractors – confirms Love, Newgren and Monroe had managed to make lifts that matched the Ford/Ferguson system without violating very strong patents. No other tractor manufacturer was able to accomplish that until the patents expired. 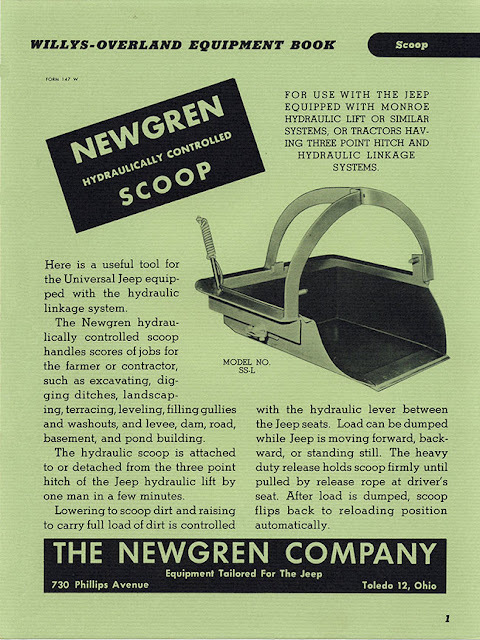 Again we see the statement that the scoop is designed for the Monroe lift, but when we see the scoop in action, it is on a Newgren lift. Perhaps there wasn’t time to get new photographs of the Monroe lift. All of the ads in this edition of the Equipment Book show equipment attached to Newgren lifts and not the Monroe. That would change with the next publication of the Equipment Book. 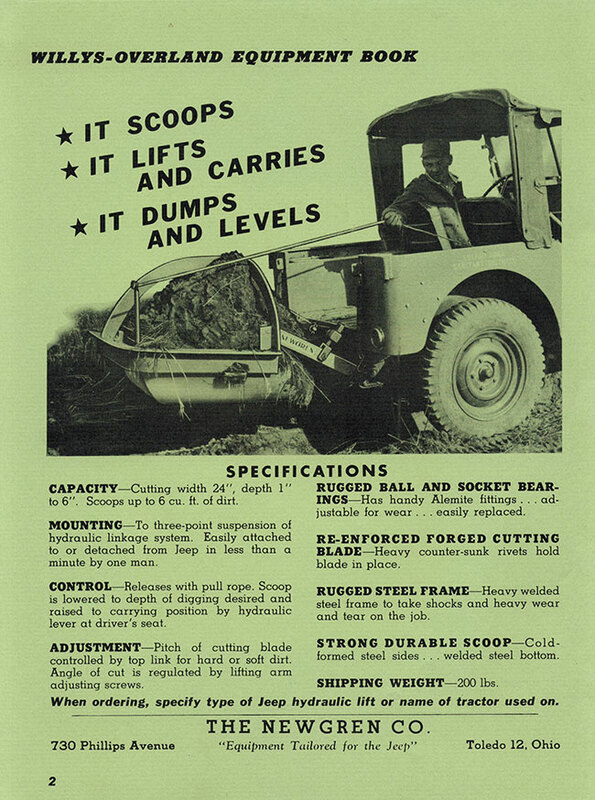 The eWillys article also included an early ad for the lift plow. In the body is the statement “A touch of the control knob on the dash lowers the plow into operating position.” We have written a number of times about the “control on the dash” that appeared in the earliest Newgren ads. We have never seen pictures of the “dash knob” but believe this early brochure confirms that the control was always between the seat and the idea of a “dash knob” was an error by the marketing staff. Thanks to Dave for providing some summer fun.